Well it just had to happen. 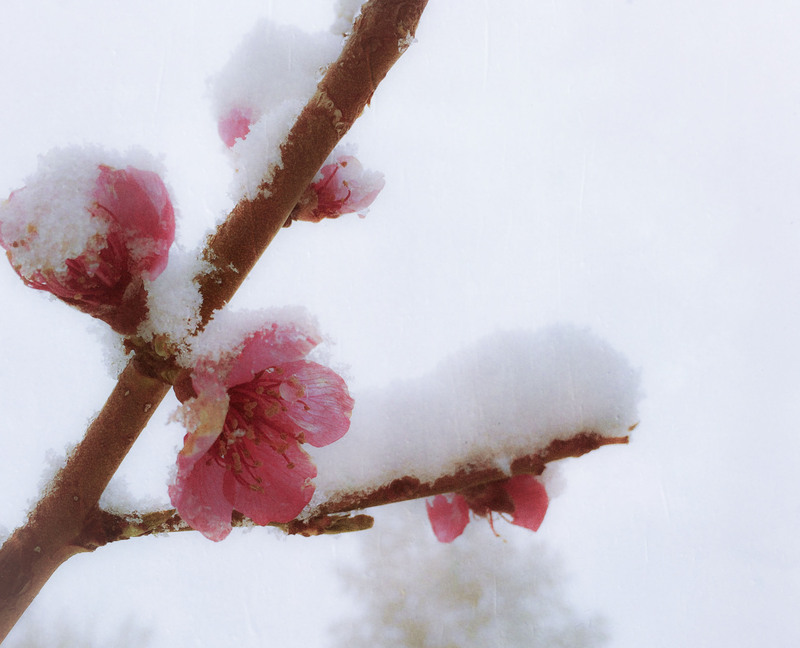 The Peach Tree just decided it was time to flower and along comes an April snow shower. Looks iffy for peaches again this year. However, given the lack of moisture we have had this spring five inches or so of an April shower is truly a welcomed event and perhaps will bring May flowers. The melting snow will keep the temps from going below freezing. They might survive and give you peaches. Hi Jim, we will see it was well below freezing last night. This happens most years and peaches seem to come only about once every 3-4 years. We have tried to cover the tree from time to time but got lazy this year. Crossing my fingers for the peaches! Thanks, it is going to take a little luck and sunshine. Hope your day is going well. Very pretty like a Japanese print, but a little sad, too. Hi Eliza, yes there is a yin-yangness to the late season snow this year. Probably another year without peaches yet we sure did need the moisture and all the plants will be very happy. It captures natures moment of harsh reality so beautifully Mike. Thanks Val. Hop your spring is treating you well.